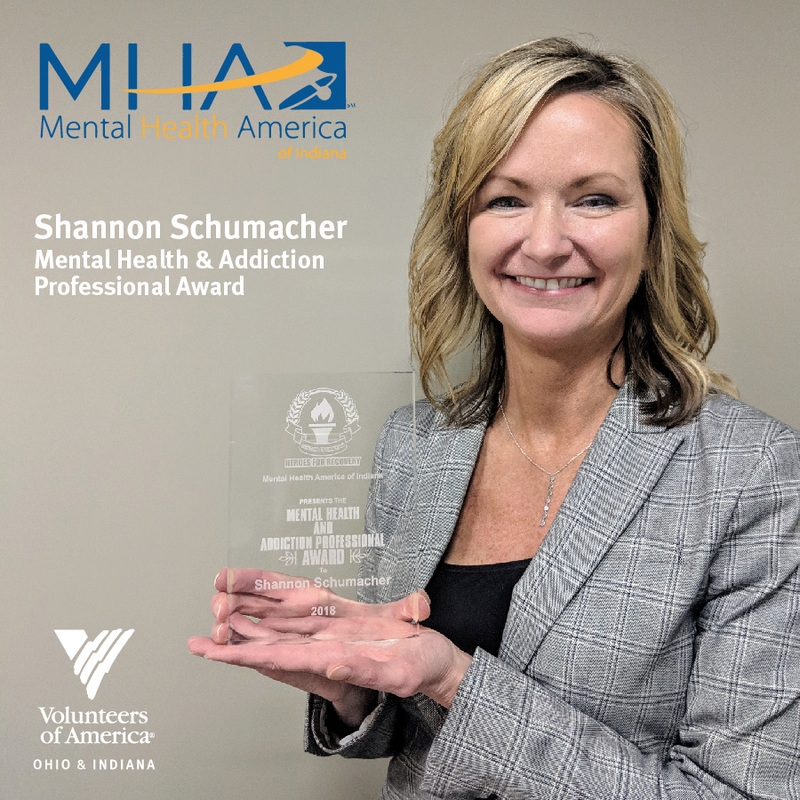 Shannon Schumacher of VOA was honored as an Indiana Hero for Recovery Award by Mental Health America of Indiana. VOA was the 2017 Impact 100 Change-Maker for their opioid recovery program. For over two decades, Shannon Schumacher has served as a powerful voice and advocate for individuals who are vulnerable, underserved and without the necessary resources to live the lives they have hoped and dreamed to achieve. Shannon has made it her life’s work to provide a voice for the voiceless. She has blazed a path to develop many innovative programs that break the cycle of addiction, incarceration and untreated mental health issues in the families in our community. It was Shannon’s passion and vision that led to the development of the Fresh Start Recovery Center which is a groundbreaking program that allows children to reside with their mothers during addictions treatment rather than being placed in foster care. At the time of the development of this program, there were no residential addictions treatment programs that allowed children to live with the mother while she was in treatment. Consequently, countless mothers had to choose between accessing treatment and risking their children being placed in the foster care system since they would not have a caretaker while the mother was away. Shannon also developed the Look Up and Hope treatment model that is focused on working with the families and children of parents who are incarcerated in hopes of breaking the cycle of addiction and incarceration that have affected these families for generations. This program was designated as a Promising Practice by the Annie E. Casey Foundation and gained national attention from many organization including Sesame Street who used the model to develop an intervention for children who have incarcerated parents. Through Shannon’s leadership, the Behavioral Health Division at Volunteers of America Ohio & Indiana has grown from two outpatient programs to four outpatient programs, and six innovative residential treatment programs with two more on the way! Shannon has completed the America Express Leadership Academy in 2016 and the Executive Development Program at University of Notre Dame in 2009. She was awarded the National 2010 Excellence in Leadership Award from Volunteers of America, and was awarded the 2013 Drug Free Marion County Community Service Award. It is impossible to know how many individual lives have been saved through Shannon’s work. And, equally impossible to understand how many future generations will avoid being caught in the despair of addiction due to her relentless fight to find hope for these individuals, no matter the challenges she faced in building the programs. She simply didn’t stop because it was difficult. Without Shannon’s work, countless children would have been left orphaned due to the opiate epidemic and hundreds of people would have gone back to incarceration due to not having another option to treat their addiction. This entry was posted in Announcements, Grants, Impact 100 in the News, Nonprofit News, Previous Grant Winner News and tagged 2017, Schumacher, VOA on February 13, 2019 by Impact 100 Indy. ← International Women’s Day, March 8!